Laripu, just to say, made your Kraut-Chi recipe and it has gone down a storm with all that have eaten it, I have run out of it but will be making some more (in bulk!!) next weekend, have just made 10Kg Sauerkraut today and will be doing 5Kg of straight Kimchi tomorrow. ped wrote: Laripu, just to say, made your Kraut-Chi recipe and it has gone down a storm with all that have eaten it, I have run out of it but will be making some more (in bulk!!) next weekend, have just made 10Kg Sauerkraut today and will be doing 5Kg of straight Kimchi tomorrow. The idea comes from the books of Sandor Katz. The actual quantity of cabbage was what happened to be on the grocery shelf at the time...it wasn't planned. A pound more or less would have been ok, as long as it fit in my gallon jar. I think my wife liked the ginger, and that it wasn't as hot from pepper as real kimchi. If you're doing these ferments in large quantities, you must be feeding many people. Here it's just me and my wife, and sometimes I'm away on business. We're only just finishing that last batch now. 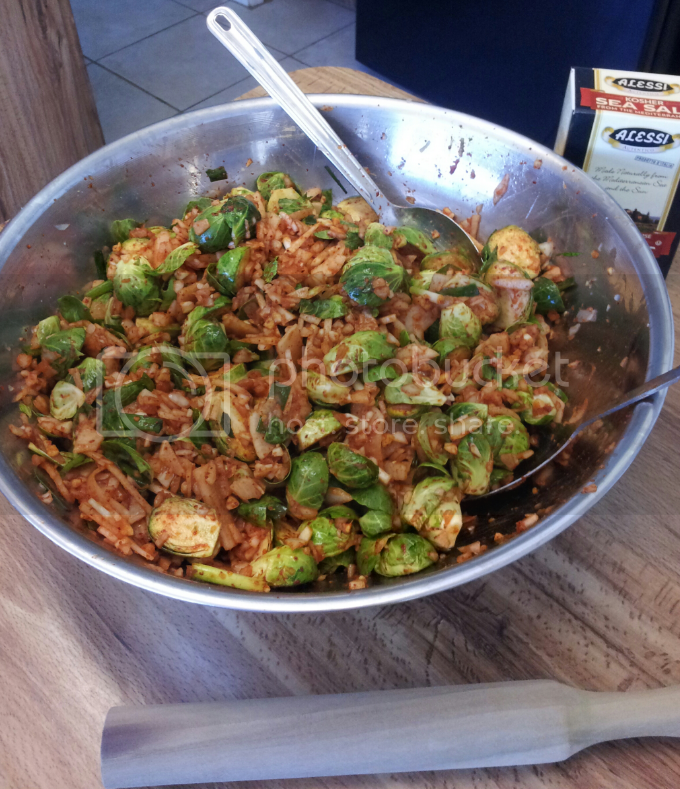 I'll be making another kimchi variant next weekend, probably Brussels sprouts & daikon. Laripu wrote: The bag full of water trick works for many, but not for me. If I consume liquid that has been in long contact with water, I get very bad nocturnal cramps in my calves, to the point that I wake up in terrible pain. It's a personal sensitivity; I don't drink bottled water, for example, unless it comes from glass bottles. YMMV. I wish I could have edited this post, but the time has elapsed. I see now that it makes little sense. I meant to write: "if I consume liquid that has been in long contact with plastic". Most of it is eaten by my daughter and I give to friends and family as well. We don't have a real culture of fermenting here in the UK so many turn their noses up at it until they get a taste and then they realise how moreish it is. Seems like you wouldn't be able to taste mine, it's in plastic food barrels!! ped wrote: Most of it is eaten by my daughter and I give to friends and family as well. We don't have a real culture of fermenting here in the UK so many turn their noses up at it until they get a taste and then they realise how moreish it is. Seems like you wouldn't be able to taste mine, it's in plastic food barrels!! It might be ok. The worst case is thin cheap plastic of the kind used for bottled water and soda, or for lids on take-out containers. The factors that worsen it are time and heat. I do buy some food products in plastic (e.g. honey), but try to avoid it wherever I can. The plastic used for food storage bags might just be the kind that affects me. I don't want to find out the hard way. When I bottle my home brew, which is fermented entirely in glass, it spends about an hour in a plastic bucket. The hoses are plastic too. Short time seems ok. I think the real reason I won't taste your ferment is that I don't have a fork that can span the Atlantic ocean. BTW, I love that word. It's not in use in the US. Yes... envelopes get soggy, plastic containers cause me physical problems and glass breaks. There's only one thing for it... I'll be over to eat some directly. Laripu wrote: I wish I could have edited this post, but the time has elapsed. I see now that it makes little sense. I meant to write: "if I consume liquid that has been in long contact with plastic". I made some Brussels sprout and daikon kimchi today. It's the same recipe as for cabbage, but instead of cabbage, I used about 4 lbs of sprouts and two pounds of daikon. The sprouts have had the base removed, and then we're cut in half. Most of the daikon was minced cut fine, but some was left in larger pieces. Everything else was chopped fine. It fit in my gallon fermenting jar. That's a jam jar inside, used to weight down the veg. I'm going to have to start making this. Your airlock system certainly makes it easier for small amounts. wheels wrote: I'm going to have to start making this. Your airlock system certainly makes it easier for small amounts. It does. But I can't take credit for it. Homebrewers have between using airlocks for almost a century, and they used to be made of glass. There's a US website that sells this system with a gallon jug for $25. I had plenty of airlocks from brewing, so I bided my time and found an old sun tea jar in a thrift shop for $3. Or someone could buy a gallon of dill pickles (in the US, at Sam's Club) for $5, eat the pickles, then drill a hole in the lid and buy the airlock and stopper for another $2.79. I'm not poor, but I like inexpensive solutions that work just fine. I once fixed a broken clock radio with a carpet tack....but that's another story. I've got some old airlocks somewhere... ...and yes, I remember using the glass ones! I'll do what you say with a gallon pickle jar, I can gets lots of those from my local pub. wheels wrote: I've got some old airlocks somewhere... ...and yes, I remember using the glass ones! I love encouraging thrift! I'm old-fashioned that way. It comes from having WWII refugee parents who never had much, yet survived brilliantly. If you used glass airlocks, you might remember WWII yourself. Anyway, just wash them well. Who knows what they've got on 'em if they've been sitting around for a long time. I need to improve my setup a bit. Using a glass jam jar as a weight isn't quite the right thing, even though it's worked.. I need to get a pair of circular glass weights of a diameter that will fit into the mouth of the gallon jar. I'll probably have to actually buy that online. I doubt I'll find it at a thrift shop.